1.3 Grade 4, WHIZ Kids! 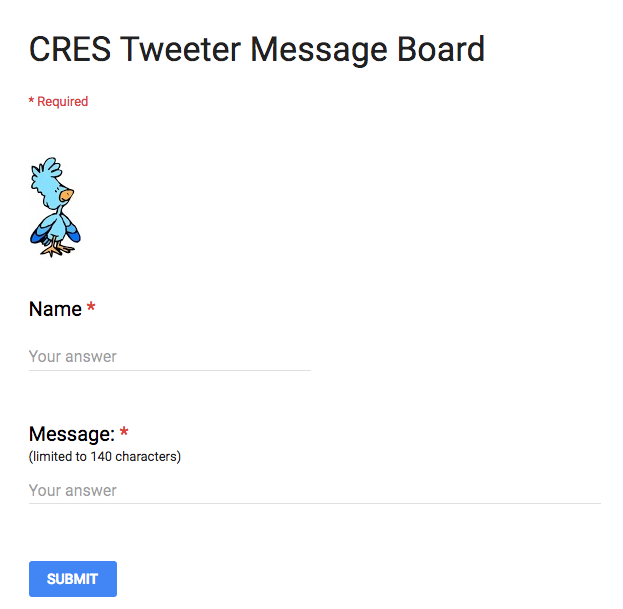 Students will use the CRES Tweeter Message Board to compose tweets of 144 characters or less. This activity gives students an opportunity to practice digital citizenship skills, requiring students to compose appropriate content. Shown below is how the form will appear to students. If students write more than 144 characters, the message area will turn red, and the message can’t be submitted. Shown below is an example of how the sheet will appear to the teacher as tweets are collected. 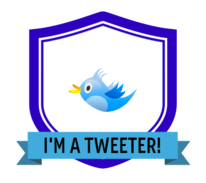 Students who successfully post to the CRES Tweeter Message Board will earn the digital badge shown below. Your teacher, Miss Anderson, will reveal the claim code to students earning the badge. Students with the claim code can access the badge at Credly. Directions: Students will submit a one word answer as the teacher poses questions. A new answer can be submitted once the backspace button in clicked. The goal is to submit a correct answer as fast as possible. When the quiz is ended, the top winner’s name and the next 5 runners up names will be revealed. 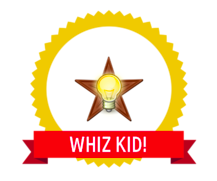 The student at the top of the leaderboard will earn the digital badge shown below. Your teacher, Miss Anderson, will reveal the claim code to the students earning the badge. Students with the claim code can access the badge at Credly.